This spring marks the team's 49th consecutive season of exhibition play at Joker Marchant Stadium. — March 10 against the St. Louis Cardinals at Roger Dean Stadium in Jupiter. — March 13 against the Miami Marlins at Joker Marchant Stadium in Lakeland. — March 23 against the Miami Marlins at Joker Marchant Stadium in Lakeland. — March 27 against the Atlanta Braves at Joker Marchant Stadium in Lakeland. 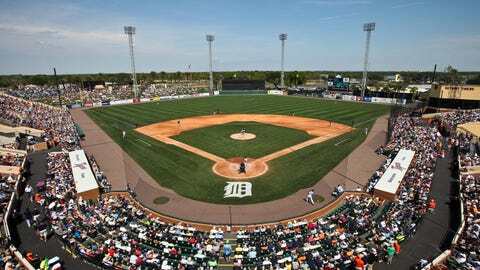 This spring marks the Tigers 78th season at TigerTown in Lakeland, extending the longest-standing relationship between a major-league team and a current Spring Training host city. It also marks the team’s 49th consecutive season of exhibition play at Joker Marchant Stadium. For a complete schedule of Tigers spring training games, visit detroittigers.com.